Republican congressmen described frantic efforts to find cover as they felt like “sitting ducks” when a gunman opened fire on them during their practice Wednesday in Alexandria, Virginia, for the Congressional Baseball Game. House Majority Whip Steve Scalise, Hill staffer Zack Barth, former staffer Matt Mika who still works out with the team, and Capitol Police officers Krystal Griner and David Bailey were wounded in the attack before officers shot the gunman. Rep. Gary Palmer of Alabama said the team was taking batting practice while he was playing shortstop. 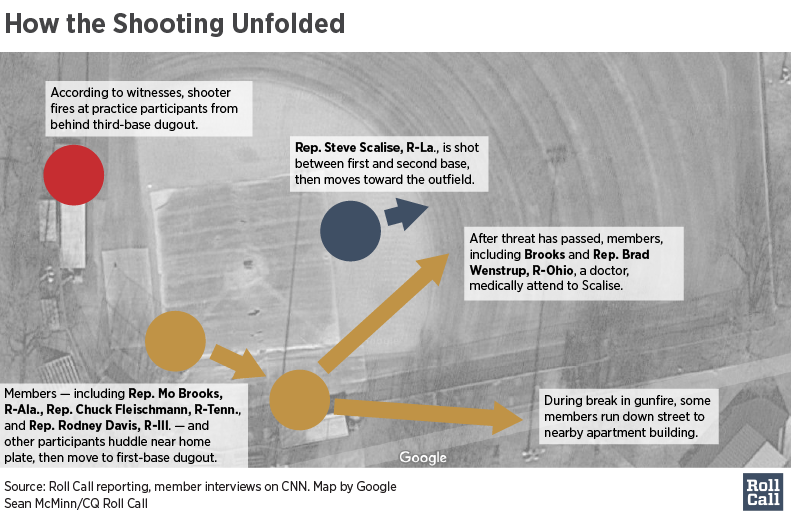 Mississippi Rep. Trent Kelly was at third base and Scalise at second base. Tennessee Rep. Chuck Fleischmann said the shooter was firing at Kelly as he ran toward the first base dugout. Fleischmann said he was standing on the third base side of the field near a batting cage, talking to Kelly, when the shooting began. He showed scrapes on his arm and said he and other members who had dove into the dugout were bleeding from minor injuries suffered trying to quickly take cover. Michigan Republican Rep. Mike Bishop said the shooter had them trapped. “This guy knew he had us trapped. And he was positioned perfectly to make sure no one could get out of this place,” he said. About 10 people had taken cover in the dugout, Fleischmann said, including the son of Texas Rep. Joe L. Barton, the team manager. “We were scared because when the gunfire, when it didn’t stop, we thought, ‘Oh my gosh, he’s going to come in there. And we’re like sitting ducks,’” he said. Meanwhile, Palmer and Kelly ran off the field and first took cover behind a large oak tree. “And then Scalise’s security detail said the guy was moving around that side. We took cover behind the big block building,” Palmer said. Welling up, he praised the two Capitol Police officers for helping protect the members. “The thin blue line held today,” Williams said. Williams said he dove to protect colleagues and that is likely how he injured his ankle and leg. He said Barth, a staffer in his office, ran into a dugout and the two men basically fell into each other’s arms. Williams said Arizona Sen. Jeff Flake took his belt off and wrapped it around Barth’s leg. He was in the same dugout that Barton and his young son were in. “It seemed like it went forever,” Williams said. “They saved all of us out there,” the Texas Republican said of the Capitol Police officers who joined the members during the practice. Georgia Rep. Barry Loudermilk said some members dove into the first base side dugout, and others ran behind it or outside the field. “When I was running, you could hear the bullets … dust was flying,” he said. “It felt like somebody dropped a big piece of metal. The next thing I heard was, ‘Everybody run! He’s got a gun!” he told CNN after returning to the Capitol. Davis said he ran to the first base dugout but said he was “on top of other people” already there, so he fled to a nearby apartment building. Alabama Rep. Mo Brooks also said he used his belt as a tourniquet to try to stop the bleeding from Barth’s leg wound. And as he was laying “face-first to the ground, breathing dugout dust,” he weighed the risk of getting up. “If you get up and run, you know you’re in sight of the shooter and he can try and take you out,” he said. Brooks said he heard more gunfire and feared a second shooter had opened fire on them. “To the far end [of the dugout] and to my right, I start hearing, ‘Bam, bam, bam, bam,’ and I look up, there’s a guy with a pistol,” he said. “I don’t know how long that was, it seemed like forever,” Barton said. After the shooting stopped, Loudermilk recalled, one of the wounded police officers went to Scalise’s aid, to where he lay in the outfield grass. Loudermilk said he went over to where Mika, a former Hill staffer who has continued to work out with the team since departing for a job with Tyson Foods, was with an Alexandria police officer. He said he prayed with Mika, who was wounded in the chest, and asked the officer if she had a medical kit and went to get it from her car. As he returned, medical technicians were arriving to treat Mika, so he took it to where Ohio Rep. Brad Wenstrup was treating Scalise. Rep. Jeff Duncan of South Carolina said he was leaving practice minutes before the shooting and encountered the gunman on his way out. In the past, Duncan said, people have looked through the fence and the shooter didn’t appear out of the ordinary from other people who pass by their practices at the field, which is set in a residential area in suburban Alexandria. — Bridget Bowman, Alex Gangitano, Griffin Connolly and Rema Rahman contributed to this report.